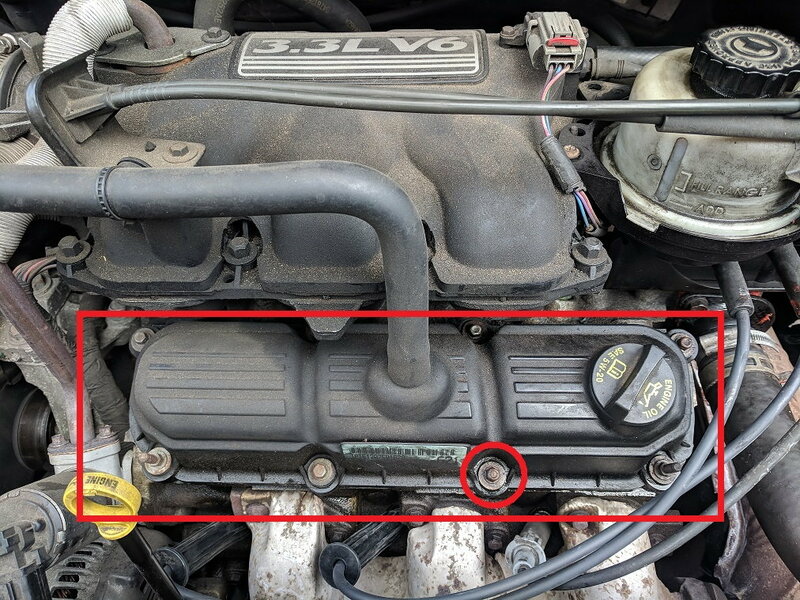 I am looking for some help, I have a slight oil leak from the screw circled in red, can anybody tell me what the thing is called in the red square, I assume it's to do with the oil but need to find the actual name, I assume that a gasket has gone and will need replacing, I have tried tightening the screw/nut and that made no difference. This is a 3.3 v6 Chrysler Grand Voyager UK (Town and Country). So I found out it's the rocker cover/valve cover. I have checked the screw again and since tightening it, the leak appears to have stopped. When I first checked, I'm wandering if it was still a little bit of oil left I had not cleaned up properly making me think the leak was still there. I will keep an eye on it, but the gaskets are fairly easy to change over and quite cheap luckily.